We here at One Fat Frog love a good movie. We’d love them even more if we could enjoy them with as little distraction as possible. Nowadays, it seems like people have lost all sense of manners and public etiquette. I can’t remember the last movie I went to where a cell phone didn’t go off. Any disruption or annoyance during a movie can forever ruin a film, so as a refresher to all of you, here are some rules to follow when going to the movies that will ensure an experience worthy of everyone’s time and money. Don’t show up half way through the movie and fumble around looking for a seat. Your late presence is distraction enough. Come in quietly, sit down and don’t ask about what you’ve missed. Everyone sneaks food into movie theaters. It’s as American as speeding up at a yellow light. However, there has to be some limitations. Restrict your movie meals to theater-friendly, snack-size portions. I don’t want to see you whipping out a Swanson’s TV dinner. Remember to keep the noise down when opening your snack. Wait for a loud action scene to tear into your noisy bag of Sun Chips, not during the emotional climax of the film. Absolutely no smelly food! Leave the chili dog in the car and grab some Junior Mints, instead. As it is written in the Gospel according to Seinfeld, “the Junior Mint is the perfect movie candy.” So say we all. We live in a fearful society, as a result we’ve all developed a need for personal space. This is an unspoken, understood law of man that is routinely obeyed at DMV’s, on elevators and in men’s restrooms. 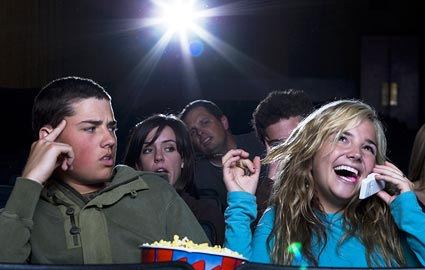 Unless a theater is packed to capacity, there should be no reason to sit directly next to a stranger. It comes off as creepy and will make everyone involved uncomfortable. That’s why I suggest leaving a “buffer seat” of one to two seats between you and the next person on your aisle. This way you can enjoy all the leg room you want and it eliminates any awkward fighting over the arm-rest. Being a parent myself, I sympathize with this. I believe everyone has the right to go and enjoy a movie… parents included. Sometimes a babysitter isn’t available, so if you MUST bring your child to the theater make sure 1.) the movie is appropriate and 2.) your kid is quiet. In the event that your kid starts crying or spoiling the ending, please quietly exit the theater until the situation is resolved. Sorry, but that’s the price you pay for repopulating the Earth. There are reminders everywhere before the movie begins to “Please Silence Your Phone,” so there should be no excuse. However, accidents do happen. If it does ring, turn it off immediately… and try to seem apologetic. NEVER answer it! Some feel that people who talk during a movie should be shot. That’s absurd! Guns make noise, silly, and noise is the last thing we want. On second thought, movies are getting too dangerous and pricey, and most of the time the quality of the film doesn’t justify the cost. 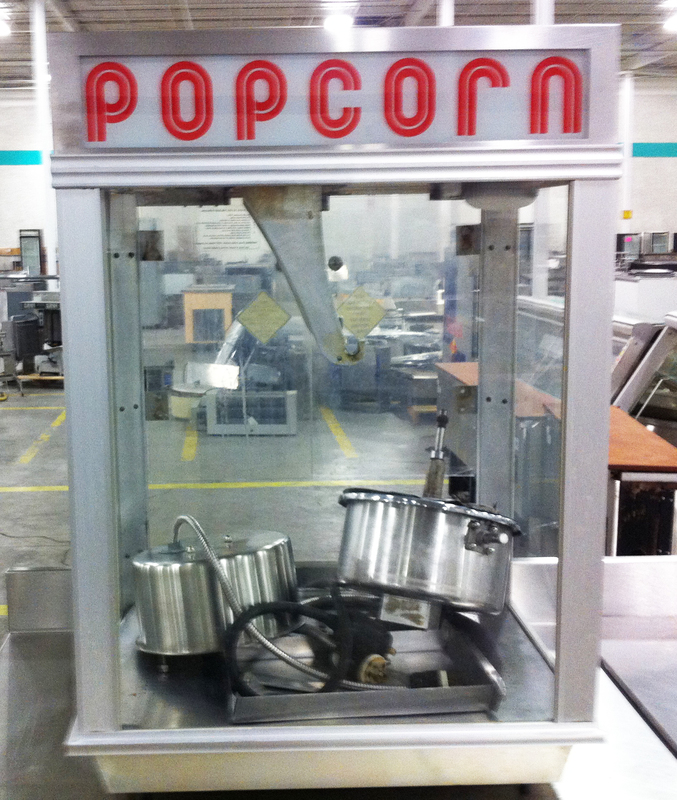 You’re better off waiting for Redbox and enjoying it in your own home theater, and what better to accompany your personal theater than a classic popcorn machine! One Fat Frog has a Citation 2100ST Popcorn Popper in stock and not only do we offer FREE DELIVERY within the state of Florida, but we also offer great financing options! For a few low monthly payments, you can sit comfortably in your home with a bowl of freshly popped movie popcorn and finally enjoy a distraction-free movie in peace. That is, unless you have kids.